SAN ANTONIO (CNS) — The “completely senseless deaths” of 10 people who died of heat exhaustion and suffocation they suffered from being held in a tractor-trailer “is an incomprehensible tragedy,” said Archbishop Gustavo Garcia-Siller of San Antonio. “There are no words to convey the sadness, despair and, yes, even anger we feel today,” he said in a statement released late July 23. 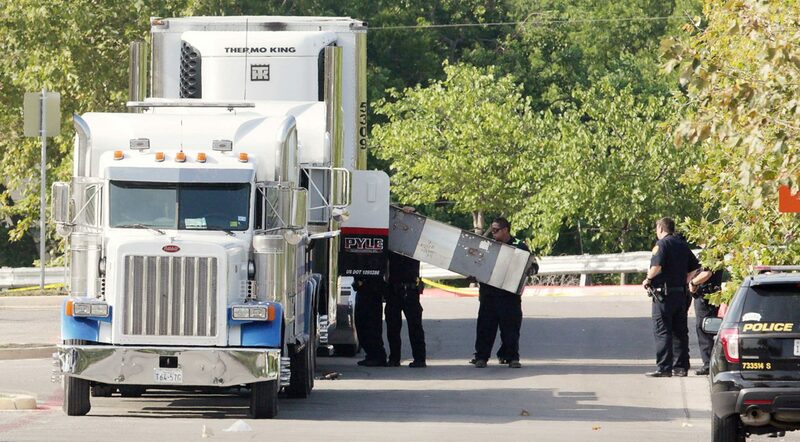 Earlier in the day, San Antonio law enforcement officials found eight bodies inside the trailer of an 18-wheeler sitting in the parking lot of a Walmart. The eight people who died were among 39 people packed in the trailer and suffering from extreme dehydration and heatstroke. At least 20 others rescued from the truck were in critical condition and transported to the hospital. Two later died, and by July 24 the death toll was at least 10. In a July 24 statement, the chairman of the U.S. Conference of Catholic Bishops’ Committee on Migration said the nation’s Catholic bishops joined their voices in mourning the loss of life and condemning the treatment of migrants, many of whom were from Mexico and Guatemala, in a suspected human trafficking operation. “The loss of lives is tragic and avoidable. We condemn this terrible human exploitation that occurred and continues to happen in our country,” said Bishop Joe S. Vasquez of Austin. “In a moment such as this, we reflect upon the words of the Holy Father, Pope Francis, ‘The defense of human beings knows no barriers: We are all united wanting to ensure a dignified life for every man, woman and child who is forced to abandon his or her own land,'” Bishop Vasquez said. San Antonio Police Chief William McManus called it “a horrific tragedy” and said it was being looked at as “a human trafficking crime.” AP reported that James Matthew Bradley, 60, of Clearwater, Florida, believed to be the driver of the tractor-trailer, was a suspect in the case and had been arrested on charges of smuggling. San Antonio is about 150 miles from the U.S.-Mexico border. The temperature in the Texas city July 23 was 101 degrees all day and well into late evening. The human cargo in the tractor-trailer was discovered after someone left the truck and asked a Walmart worker for water, AP said. In his statement, Archbishop Garcia-Siller said the community was praying for the recovery of the adults and children who were hospitalized. AP said that at least four of the survivors were between the ages of 10 and 17. “Catholic Charities of the Archdiocese of San Antonio has already reached out to our mayor and promised to offer whatever assistance is needed. We will do anything possible for these brothers and sisters and their families,” he said. Archbishop Garcia-Siller said the tragedy was “a clarion call” for the nation to make immigration reform a priority. “Everyone — the churches, law enforcement, state and national elected officials, civic organizations, charitable groups — has to prioritize the immigration issue and truly work together in new ways which have eluded us in the past for common sense solutions. No more delays! No more victims!” he said. “Unfortunately, law enforcement has reported an upsurge in these types of human smuggling and trafficking operations at the border in recent months,” Archbishop Garcia-Siller said. Such incidents involve “increasingly desperate individuals seeking safety and a better life for their families placing their well-being and indeed their lives in the hands of reprehensible, callous smugglers and traffickers,” he said. In a separate statement, the Austin-based Texas Catholic Conference, which is the public policy arm of the state’s Catholic bishops, joined Archbishop Garcia-Siller in mourning the migrants’ deaths and praying for the survivors.